Canny and ferocious, with the power of an ancient Goddess in her belly, Rowan Summerwaite is the only person who can renegotiate the fragile Treaty between the Vampire Nation and the Hunter Corporation, the last line of defense for humanity. A meeting of this Joint Tribunal, as well as her new status as Liaison, sends Rowan straight to the last place on earth she wants to be, the childhood home she’d escaped so many years before—The First’s Keep. Raised at the knee of The First—the oldest Vampire and leader of the Vampire Nation—honed into a weapon by the Hunter Corporation, wielding ancient knowledge from the Goddess within, Rowan must navigate bloodthirsty Vampires and Hunters alike. And she’s got to do it while managing a politically awkward but undeniably deepened romance with Scion Clive Stewart. Failure in her role as Liaison could mean all-out war, with humankind in the crosshairs. No pressure. Walking the path between her two lives has already made Rowan a pariah. The choices she’ll have to make will mean she becomes something even more Other and as a result she may lose those last shreds of home she has left. See how Rowan’s story began in Goddess with a Blade. 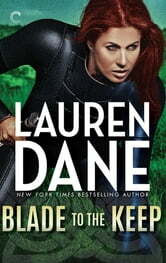 And don’t miss Blade on the Hunt and At Blade’s Edge, available now!